This landmark, tower in excess of 400 metres tall, sits in landscaped gardens with dramatic water features and incorporates office accommodation, together with a conference and business centre. A medium-sized mall complex adjacent to the tower offers an anchor store, luxury retail units and a food-court above which a further 4 storeys of high-quality VIP office accommodation offer independent and exclusive working spaces. The entire project sits over two storeys of basement car parking. A contemporary mosque with its round shape and sharp minaret occupies a prominent position within the mall; it offers two levels of praying for the shoppers, office staff and other visitors. 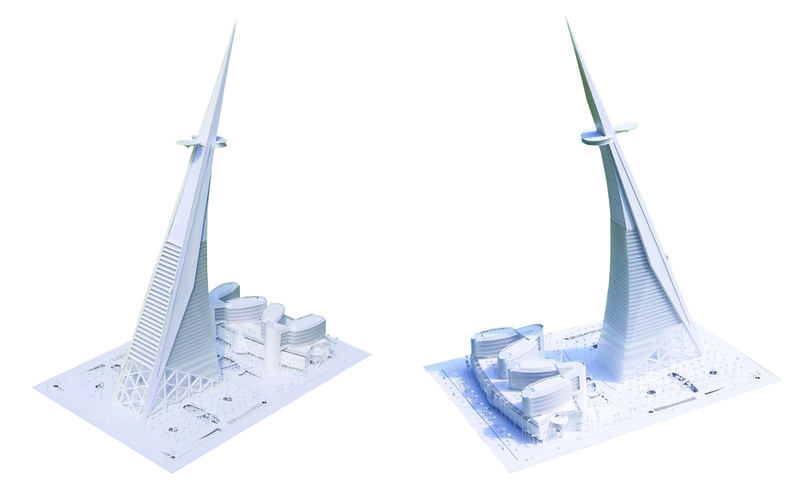 With a sweeping curve on one side, the tower is anchored by two robust legs, which stretch skyward up its straight side, vanishing to a point. This unprecedented dynamic shape makes it instantly recognisable. The office component hovers above a 50 metre high atrium offering a spectacular space for gathering, meetings and exhibitions. The new tower will offer both local and international companies modern and flexible office spaces. Two external funicular lifts transport guests to a panoramic restaurant at the top of the tower. Access for both vehicles and pedestrians has been carefully considered so as to optimise the flow around the tower ensuring a safe environment for all users of the building.